30-Sep-2000 -- Woke up this morning and found it to be another outstanding day. Crisp and cool with clear skies. Looks like a perfect day for a scooter ride in search for a confluence. I pulled up the WEB site to what was close that had not yet been visited. 31N 89W seemed to be a good choice. According to DeLorme this target is 131 miles West Northwest and in Mississippi. This was and added benefit in that, according to the WEB this confluence would be the first for Mississippi. I prepared Scoot any struck out for the target. 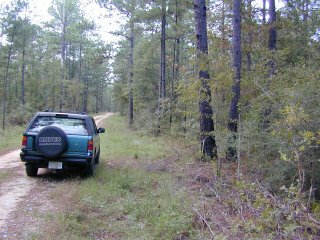 The target is in the middle of DeSoto National Forest but appears to be accessible via a nearby road. I would take US 90 West to Mobile then Hwy 98 to Lucidale, Ms. then Hwy 26 to 57 where I turn on Deep Creek Rd which turns into Bendale Rd. Then 1.2 miles from the target turn on Kenny Patterson Rd. The ride was awesome especially from Deer Creek Rd where I entered the National Forest. I saw numerous birds and the most beautiful fawn I've ever seen. The route was easy and straightforward. All were paved until Kenny Patterson (31N 88.58.6W). This is a good quality dirt road but is not marked. The target is 1.2 miles down this road. According to DeLorme the target is located just south of this road. In reality, my Garmin GPS12 recorded the target on north edge of this road. Before leaving I cut a 2-foot piece of 1/2 inch PVC pipe. I drove this into the ground at the target. Since I read the spot as being on the very edge of the road I place the PVC about 5 feet north so as to perhaps extend it longevity. I only had one problem. NO film in the camera!!! Dog gone this CRS is getting worse. Returned on 10/1/00 to get picture. In the east-looking west photo you can see GPS on bumper reading target. PVC is just to right by the tree.